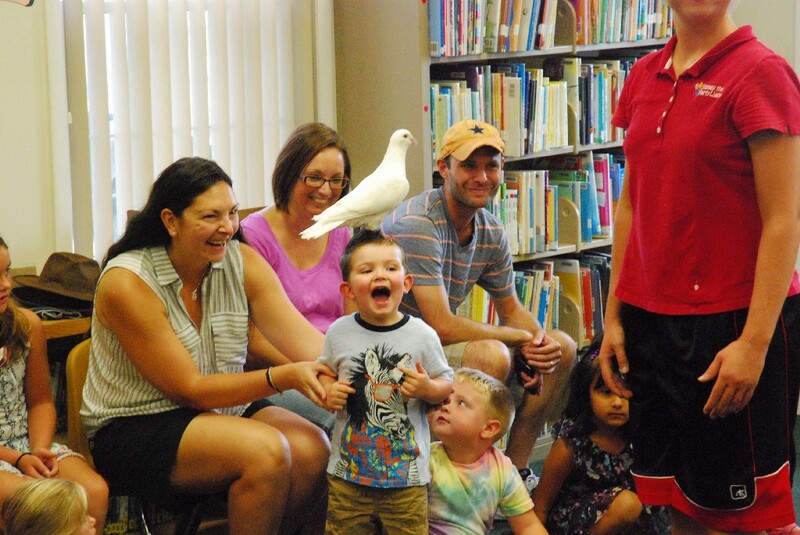 Approximately 50 children were treated to a special animal show at Marie Fleche Memorial Library Aug. 16 in celebration of the end of its summer reading program. The program began on June 25 and came to an end with the show and a pizza party. During the summer, children were able to come to the library and check out books to read. There were two groups for children in different age groups, so those that can read on their own and those that needed an adult to read to them were both included. Drawing prizes would be courtesy of local businesses that would donate a prize for the kids to accept. Colette Bogie, owner of Stoney The Party Llama, brought approximately a dozen animals to teach the kids about where they come from, their natural habits and on overall animal safety for the end of the summer party. The show lasted about an hour and featured a sugar glider, two chickens, a hedgehog, a chinchilla and numerous other animals. The children were able to feel the soft fur of some animals, while being able to watch others perform some tricks and cool stunts. Also, the kids that attended the party had the chance to do the chicken dance with a real live chicken. According to Bogie, all the animals in the show, except for one, are rescues. Bogie owns all the animals and has been performing shows for approximately 20 years. During the summer, she does a show just about every day at varying locations such as libraries, preschools, camps, nursing homes and private parties.